After publishing your research paper, the one thing you want most is for your paper to get maximum attention. Open access publishing can help you do that! Open access publishing has been shown to increase not only visibility but also citations of published papers. Today, more and more journals, publishers, funders, and institutions are supporting open access. 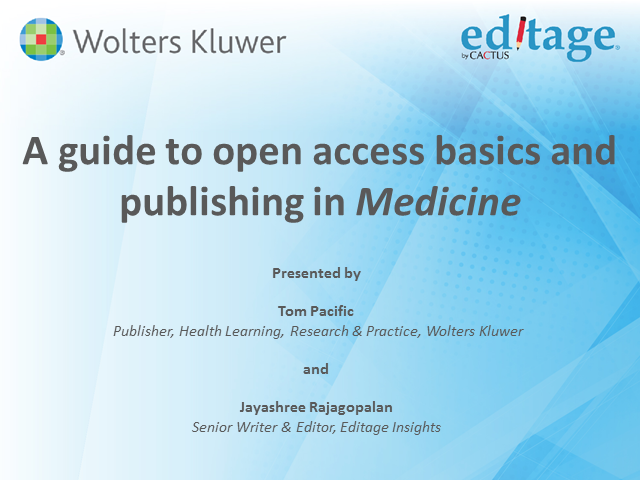 This webinar explains the benefits of publishing in the open access journal Medicine®, Wolter Kluwer’s broad-spectrum open access publication. It will also provide basic general guide on what open access is, its features, and how it works.